Like Hostessware? Buy the most complete guide to Pacific Pottery Hostessware available. This is the only complete list of known Pacific Pottery Hostessware pieces. As one of the most extensive collectors of Hostessware, I compiled the list based on my own deep collection, other preeminent collectors, company catalogs, and other source material. The breadth and depth of the Pacific Pottery Hostessware line is pretty incredible.With more than 200 different pieces in this line produced over a period of just ten years, Hostessware stands out as the most extensive dinnerware line produced in the 1930s. The Hostessware lineup included a wide range of individual pieces, serving ware, and kitchen items. There are indications that Pacific produced many one-off or limited production pieces that would be displayed in their company showrooms for department store buyers. If buyers picked it up, then the piece would be more widely produced. Everyone wants to know about pricing, but the dinnerware market in general is fairly soft. Pacific is not widely collected due to relative rarity of the pieces, and pricing can vary wildly. The prices in the existing reference book are very out of date (not to mention biased) and are significantly higher than current market prices. The good news is that you can pick up Pacific fairly cheaply, the bad news is that it will take you a long time to pull a set together. If you have a particular question about pricing or value (or are looking to sell something), send me a note. A reminder that just because something is rare doesn’t necessarily mean it’s desirable. Check out Informal! 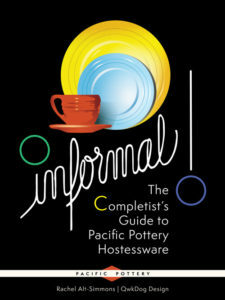 The Completist’s Guide to Pacific Pottery Hostessware for a complete photo reference and information about each piece. Examples can be found in the gallery.